For those quilters wanting a little more of a challenge, five inch quilt blocks might be the answer -- smaller blocks usually means more blocks to make. Another reason for using five inch blocks is to create a secondary pattern. By using 4 blocks and rotating each of them, you get a different larger quilt block. These larger blocks can then be laid out in variety of ways to make some very interesting original designs. 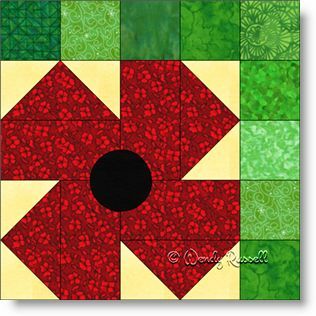 The Poppy quilt block is a simple five patch block (so named as it is constructed on a 5 x 5 grid) and an easy one to construct. It contains only simple shapes, the square and rectangle, and another of the very common patches in quilt making -- flying geese. The simple circle shape that is the centre of the poppy is appliqued on top of the block as a last step. As you will note, by rotating or flipping the block in a variety of ways you can achieve different arrangements that appear as "borders" for the blocks. You could also choose not to include the outer pieces (shown here in green fabric) for a simple poppy all on its own. The sample quilts illustrated give you some ideas of possible ways to create your own quilt.